Death is preferable to the defensive. Seeking another reliable, competitive linebattle event to fill your regiment's Thursday slot? 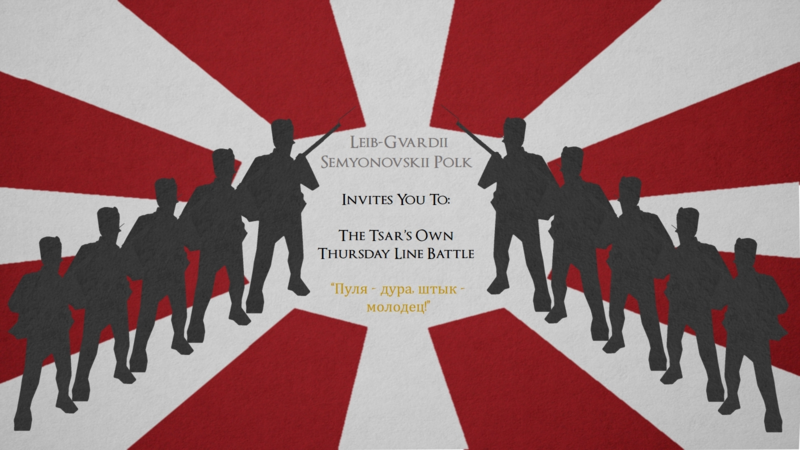 The LG.SP would like to present the Tsar's Own Thursday Linebattle. Hosted every Thursday at 8 PM EST without fail, the Tsar's Own event will provide a satisfying linebattle experience with opportunities for skirmishers, artillery, and, of course, line infantry-based clashes. Avoid slurs of all kinds in any ingame chat. Banter is allowed. Take it too far or clutter the chat with senseless drama too much and admins will step in, however. Do not spam the chat. Save criticism for the linebattle for our Discord discussion channel. We are unlikely to effectively record suggestions in the heat of the moment. Bush pirates will be punished with extreme prejudice. Do not troll or hold up the linebattle for any reason at any time. Rounds will only go on for 15 minutes maximum before an all charge is called. 2 of each auxiliary maximum for any regiment is permitted. Officers and specials must stay within compass range of the parent line. If a single member of the line is engaged in melee, the whole line must cease fire and commit to the melee fight as well. This includes skirmishers and auxiliaries. Once the line dips below 3 members, it is no longer a line and must charge or join another line. Officers do not count as linemen. Auxiliaries and skirmishers may fall in to count as linemen, but then cannot leave the line for any reason. No firing out of line at any time for any reason. No fire on the charge. Pistols of all kinds may fire once on the charge. Pistols may fire freely at any time. Half man spacing at most is allowed. Lines need not fix spacing if casualties are taken during an exchange of fire, but if they re-position, they must be fixed. For every 5 line infantry in a line, 1 member may go light infantry. Skirmishers must stay within 25 meters (or compass distance) from their parent line. Skirmishers may fire on the move, but if the line is engaged in melee, skirmishers must engage in melee as well. There may not be more than 3 personnel assigned to an individual cannon or rocket, whether it be guard or crew. Artillery crew and guards must stay within compass range of artillery pieces. Artillery crew and guards may skirmish freely within compass range of their artillery pieces. Artillery may not be touched by crew until the round is declared live. Artillery may be stolen at any time by enemy team. Please respond to this thread with this application format to be permitted into the event. Please, regiment leaders and regimental officers join our Discord here to receive server information and event-related updates. Thank you! Tyler 1 - Vive La GGR! Have you read and accepted the rules? : Absolutely not. Have you joined the LG.SP Discord? : Yes sir. Attending once to see how it is! Our first event was a huge success! Thanks to the regiments who attended! We plan on hosting it again at the same time next thursday.